Grizzly bear cubs are born in the den in January or Febuary. The cubs will weigh approximately 500 grams ( 1 ½ pound) at birth, and arrive into the world blind, hairless, and toothless. The cubs will grow to weigh 3-4 kg (7-9 lbs.) prior to emerging from the den in spring. 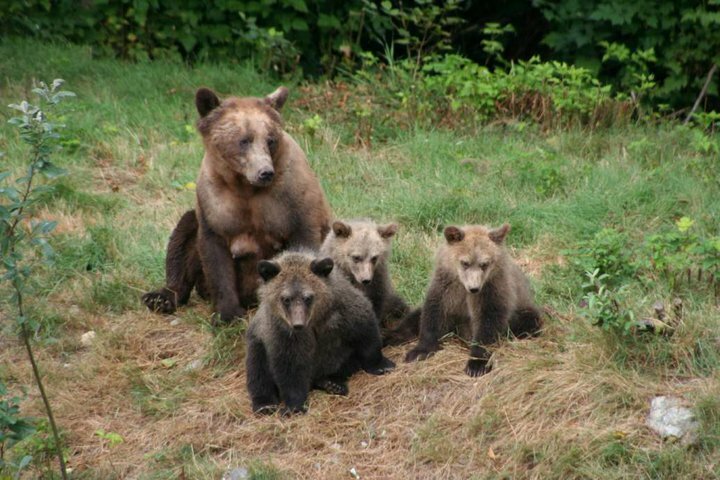 This photo was taken in early September so these first year cubs are six or seven months old. As you can see from the photo that this mother grizzly is still nursing. 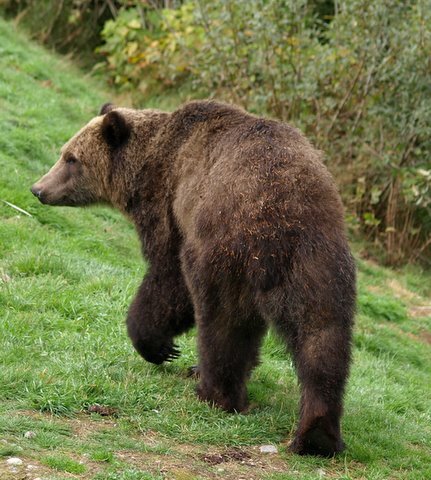 The milk from a grizzly is rich in fat, approximately 30% compared to a cow at 3% so these cubs will weight 27 – 45 kg. (60 to 100 pounds). Also the photo shows the difference in size in the three cubs the one being much larger. This is common and shows which of these cubs has a better chance of survival. Two incredible photographs the first being a humpback whale lunging through a ball of herring directly toward the boat. A perfect photo showing the herring in the spray, the baleen along the lower jaw and the growth on the pectoral fins. 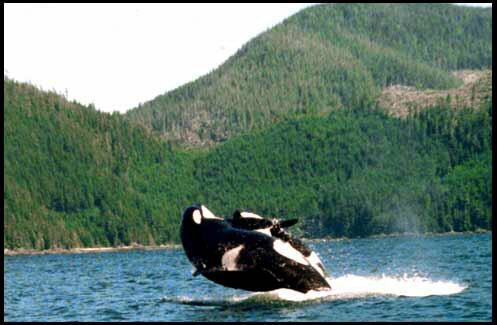 The second shows a female orca coming out of the water on its back with a calf on its belly. A unique photo that I have never seen duplicated or heard of from another guide in the area. Comparing the two photos one would say the humpback is much clearer, more close-up and would win as a photo until you were told that the orca photo was taken twenty of more years ago on 35mm film. So no second chance or multiple digital shots just a once in a lifetime photo. This grizzly bear had just spent some time rolling in the grass at the backside of the first viewing stand on Knight Inlet’s Glendale River. If you take time to look at January 1, 20014 post it shows a section of Google map showing the location of the viewing stand on the rivers spawning channel. 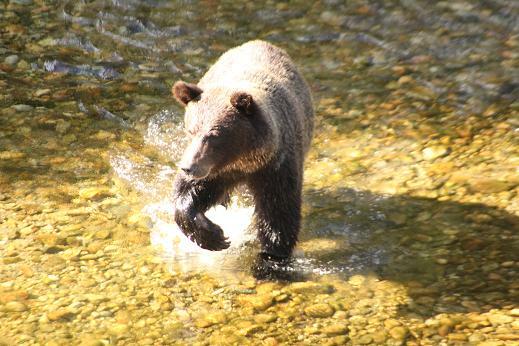 This bear has just left from beneath the stand and is strolling down the finger of land that separates the natural river from the holding pool where the salmon wait before entering the spawning area. The grizzly bears in our viewing area have come to tolerate or presence and ignore the click of cameras. As long as there are no flashes or sudden loud noises all in fine. Tim O’Neil of Great Britain provided this photo. The “not bad” title is patting myself on the back for one hand controlling the throttle and steering wheel and the other is taking a picture of some pacific white sides playing beside the boat. 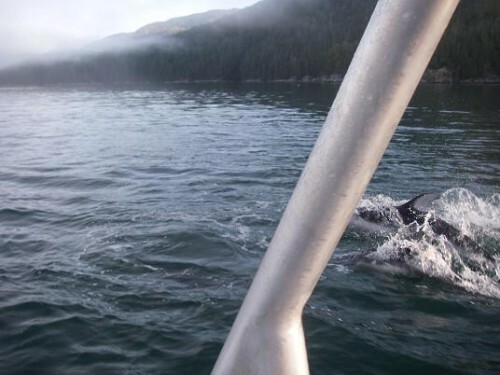 I am not saying that one click got the photo because I tell the guest if you get one or two good pictures from fifteen minutes with the dolphins you have done well. However there will be many of sky, water and splashes. 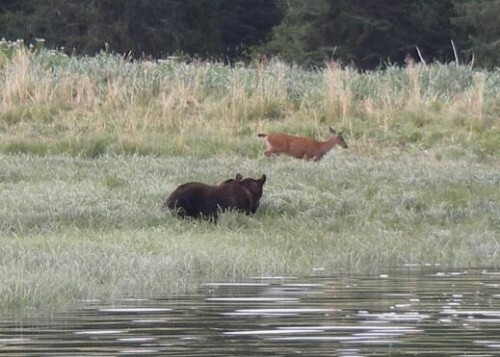 Grizzly bear watching from late May until August 24th occurs along the shore of Knight Inlet and most often in Glendale Cove and on the River. We travel up the inlet to the cove and transfer to a 5.5 meter (18 ft.) flat bottom skiff we use to move along the shore and up the river with a rising tide. Grizzlies are on the shore turning over rocks for the crab, clams, barnacles, amphipods and other tiny invertebrates. In the river they graze on the sedge grass and dig up roots. 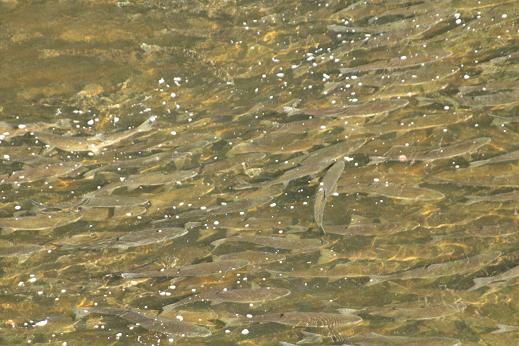 In all of this time they are waiting for the salmon to arrive. 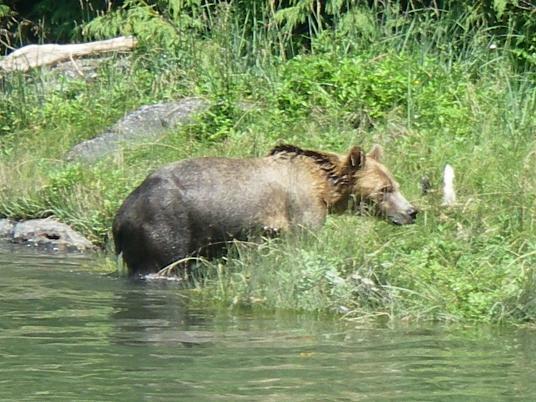 On this day we have five grizzlies, one in the water looking for salmon, and four on the bank digging and grazing. The first half of the season tends to be eye level viewing whereas that changes in tomorrow’s post. Comparing the photos in today’s and yesterday’s post they do not look like the same grizzly but the camera time stamp says they are the same. This is an August bear and does not have the fat layer it will have after feeding on salmon for September through October. 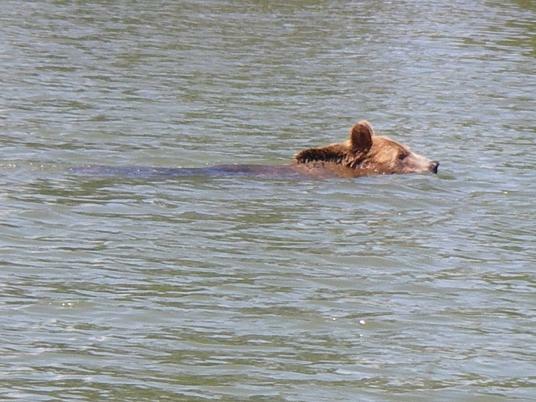 This is noticeable by how low the bear is in the water is yesterday’s post. A fat bear would have much more of it’s back out of the water. Grizzly bear viewing from our lodge is an hour and quarter boat ride up BC’s Knight Inlet to Glendale Cove. Once in the cove we change into a 5.5 meter (yard) flat bottom skiff that allows us to follow the grizzlies along the shore and up the river. On this day a grizzly bear was taking a short cut across the bay and we were able to get some good photos. Part way down the column on the left of this post is “Pages” and under that “Google Map of Itinerary” if you take the time to follow the link and read the instructions you will have the “Google Earth Map” of our viewing areas. Photo time 8/25/2015 11:11 First day on the grizzly bear viewing stands is August 25 and as yesterdays post shows the first photos are of the salmon because the grizzly bears are not on the river. But 13 minutes later the grizzlies arrive and I remember that it was a good day because Glen reported eighteen grizzlies on his first day at the stands. 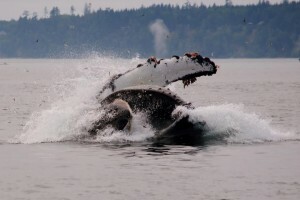 Whale watching – A classic!! Not much to say except it was a beautiful day whale watching. Calm water and a pod of orca / killer whales with sun glistening off their backs. May we have many more. The sedge grass is about a meter (yard) tall and with the rising water the grizzly bear is likely standing in water up to its belly. Footing along a river bank is quite slippery and more so in water while the deer is one leap from solid footing. But even on dry ground we frequently see grizzlies and black tailed deer feeding side by side. The chance of a grizzly bear catching deer is so low it is not worth wasting the energy trying.